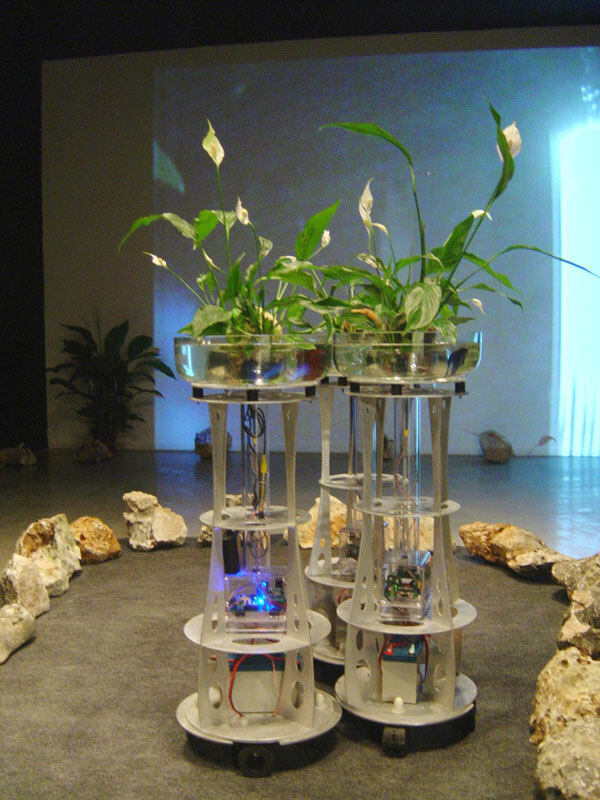 The Augmented Fish is comprised of 5 rolling robotic fish-bowls, designed to explore interspecies and trans-species communication. In these interactive robotic sculptures, Siamese fighting fish use intelligent hardware and software to move their fish bowls anywhere that they desire. By moving about they choose to interact with their environment and other Siamese fighting fish which can also see clearly beyond their glass bowls as well as control their fish cars. OK CENTRUM FOR CONTEMPORARY ART, ARS ELECTRONICA Linz, Austria. Nov. 17, 2004, CyberArts 2004 juried exhibition. Award of Distinction in the Interactive Arts Category. 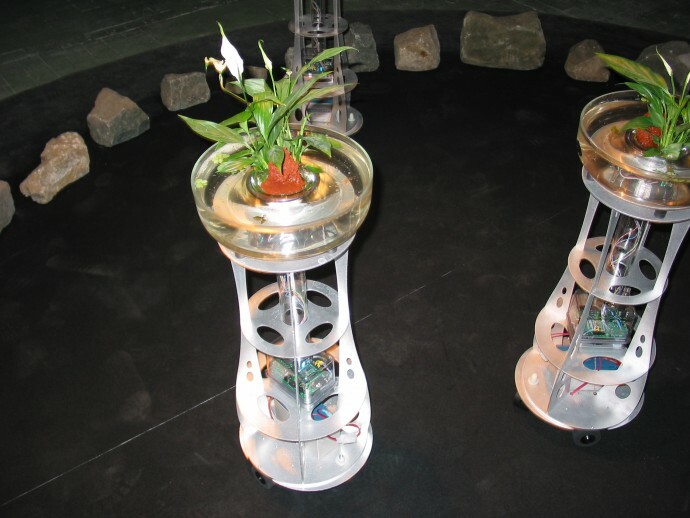 Displayed 3 robots of Augmented Fish Reality by Ken Rinaldo. These works premiered and were commissioned by the European Capital of Culture, Lille France 2004 invited by Director Richard Castelli. In an article entitled Learning in Fishes (Fish and Fisheries, 2003, vol. 4), editors Dr.s Kevin N. Laland, Culum Brown, and Jens Krause discuss revisions in thinking about fish intelligence, which seems much greater than was formerly imagined. It is now believed that fish are “steeped in social intelligence.” The article reports that fish pursue “Machiavellian strategies of manipulation, punishment, and reconciliation” while also displaying “cultural” traditions and cooperation to elude predators and obtain food. It is said that fish track the relationships of other fish in their environment and even monitor the social prestige of other fish. 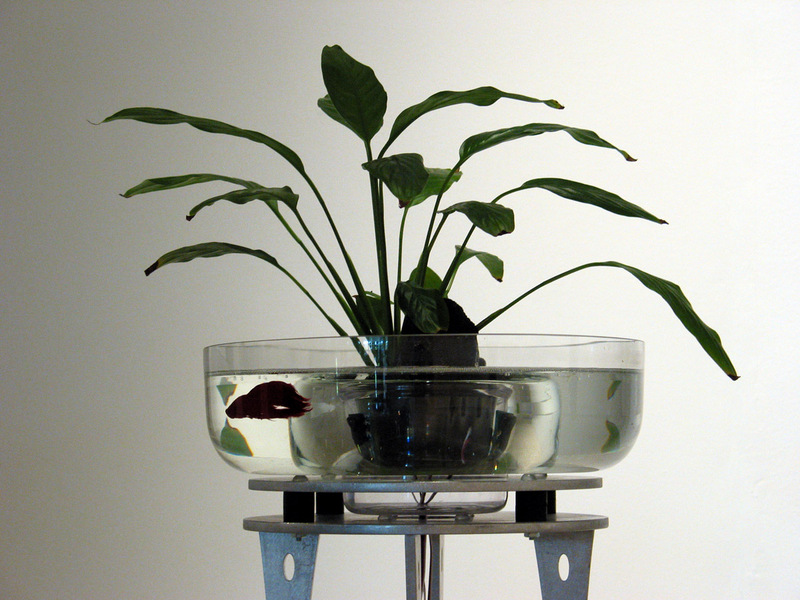 Each robotic fish bowl in Augmented Fish Reality is equipped with four accurate infrared sensors. As each fish swims in front of the sensors, it activates the microcontroller which activates motorized wheels in each fish vehicle. The sensors allow the fish to move the robot forward and backward and to turn it left or right. Humans interact with the work simply by entering the environment, which often draws the fish gaze. 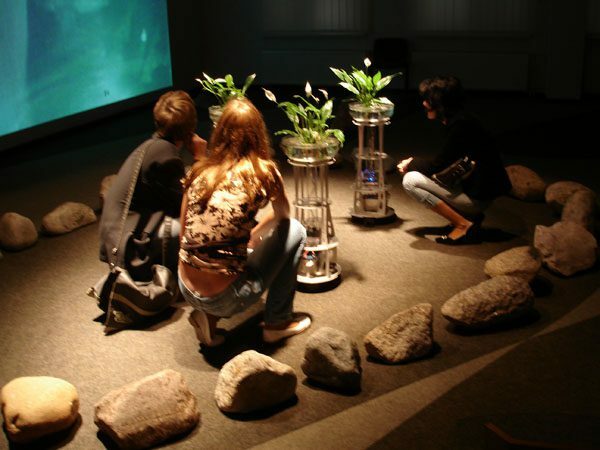 Still, important these robots are under fish control, (interactive art for animals) and the fish will choose to approach and/or move away from human participants whenever they choose. Siamese fighting fish are top breathers, so they are very comfortable in an oxygen-deficient environment. They take gulps of air from the surface in order to get enough oxygen, and a larger bowl, such as the ones used here, is great as a long-term habitat since there is a large area of water in contact with oxygen. Augmented Fish Reality by Ken Rinaldo at THE WORLD OCEAN MUSEUM Kaliningrad, Russia. Sep. 2006 curated by Dmitry Bulatov. 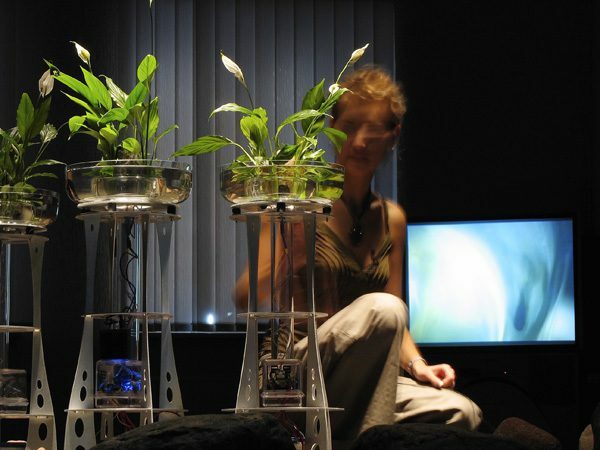 This living environment also includes a peace lily plant that absorbs and prospers from the fish waste, and, in turn, provides oxygen to the fish. There are stones in each tank to make the fishes’ world more natural, friendly, and complex. There are both male and female fighting fish, and the robots are designed so that the fish can get within 1/4 inch of each other for visual communication. 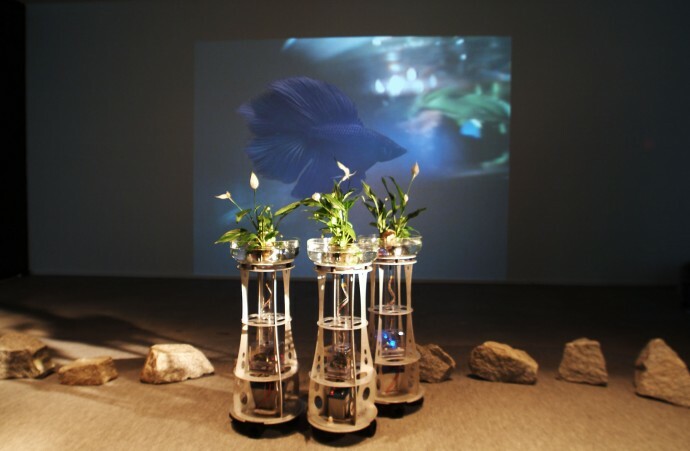 Additional elements to this interactive installation are small lipstick video cameras mounted on forty-five-degree angles under one of the bowls that project images onto the gallery walls from the perspective of the fish. .I do believe that we will eventually, better break down inter-animal barriers, by analyzing animal behavior, motivations, and strategies of communication with statistical vision systems and with computers. We will be able to decode their behaviors in relation to animal communication and environmental interaction and that will be exciting as it also reveals things about the human animal. Letters from Dr. Culum Brown, a leading fish researcher, suggest that he is certainly convinced that if the fish were to grow up in this environment, they may learn to use the interface, especially if rewarded with food. Currently, the only reward the fish get is the social interaction of meeting each other across the gap between the glass and seeing other viewers. Their environments are complex and rewarding. 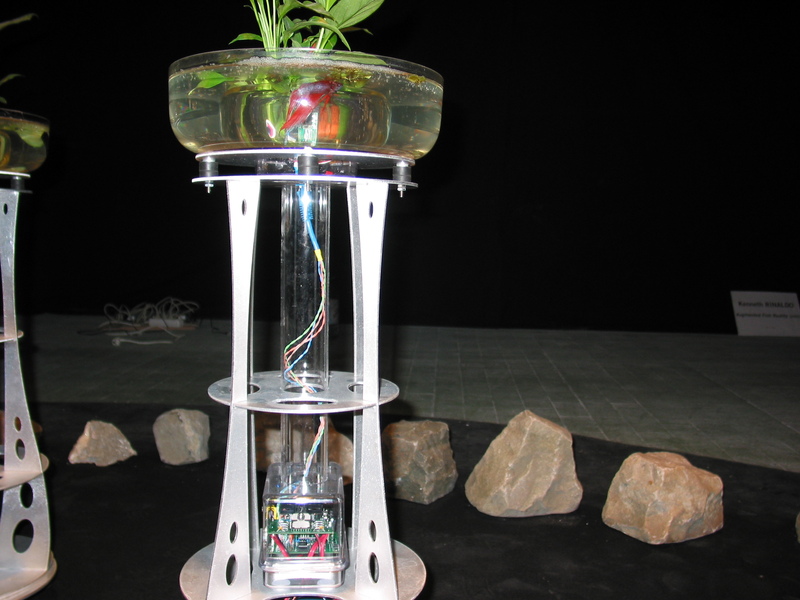 Robots are very good at sensing and responding to both fish and human action. Artist documentary about The Augmented Fish Reality. Invited by curator Dmitry Bulatov. Evolution Haute Couture: Art and Science in the Post-Biological Age. Artist documentary about The Augmented Fish Reality. Invited by curator Dmitry Bulatov. 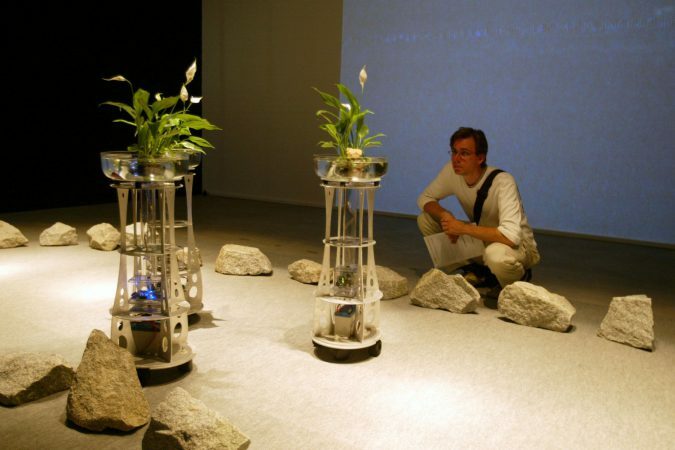 The Autotelematic Spider Bots, Augmented Fish Reality, Our Daily Dread, Farm Fountain and Machinic Diatoms. Invited by curator Craig Martin. Catalog produced. 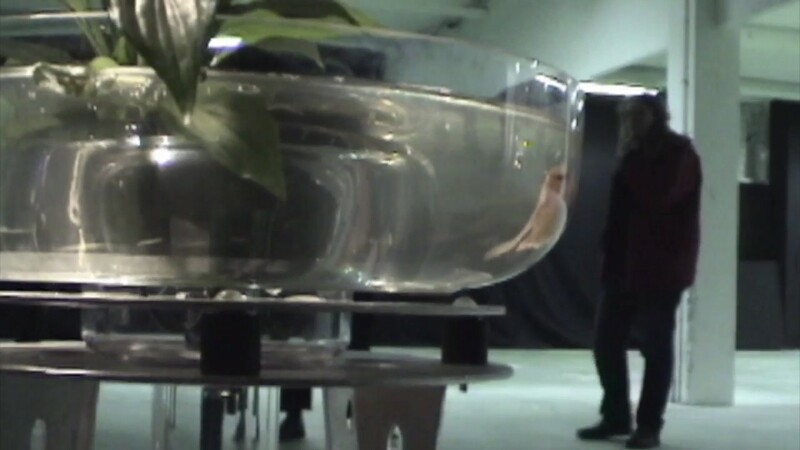 Augmented Fish Reality curated by Dmitry Bulatov. Augmented Fish Reality & AutoTelematic Spider Bots curated by Ken McCollum. Invited. 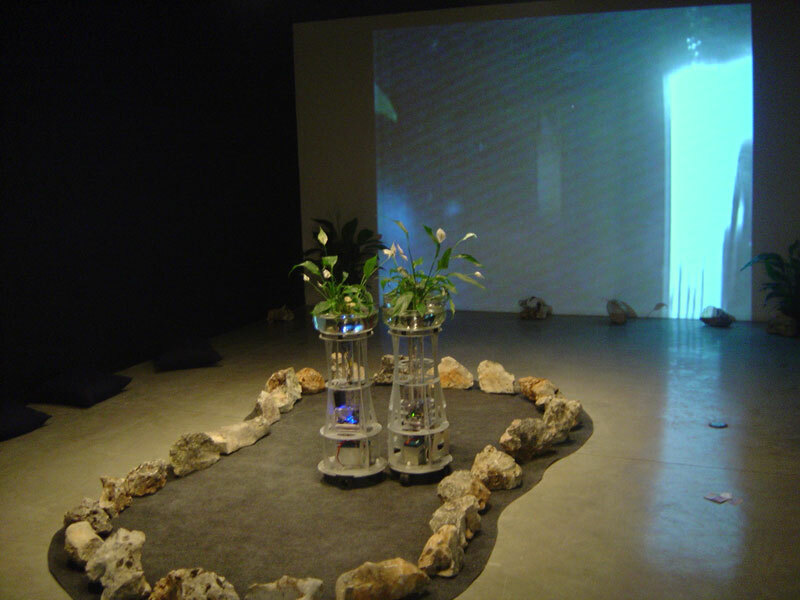 CyberArts 2004 juried exhibition. Award of Distinction in the Interactive Arts Category. Displayed 3 robots of Augmented Fish Reality. The premiere of the 5 robots of Augmented Fish Reality commission, Mediated Encounters and Autopoiesis, as part of an exhibit on robotic art curated by Richard Castelli. Invited. ARS ELECTRONICA Linz, Cyberarts Catalog, for Award of Distinction for Augmented Fish Reality. 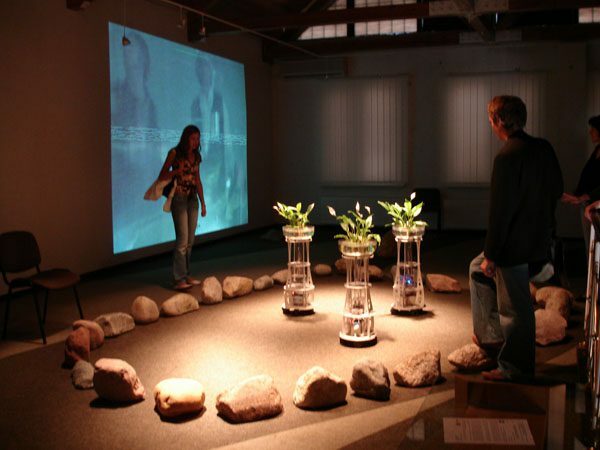 Realtime Magazine, “The gallery reconfigured: BioDifference: The Political Ecology “by Tony Reck, review of Biodifference and Augmented Fish Reality, 2004.